Modifications are always given for individuals of all fitness levels as well as those with medical limitations. Safety, proper form & breathing are always emphasized. All participants must receive medical clearance before participation. Experience all of the health benefits of yoga with specific emphasis placed on the special needs & concerns of seniors including improving overall functional capacity. Participants have the option of performing all exercises, floor & standing, while sitting on a chair instead. Specific functional fitness exercises are fused with yoga postures to improve overall functional capacity while providing participants with the additional benefits of mind-body exercise. Specific emphasis is placed on the special needs & concerns of seniors. Participants have the option of performing all exercises, floor & standing, while sitting on a chair instead. 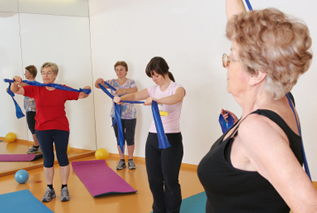 This fitness class is developed specifically for seniors who want to stay active and independent. This class will encompass a wide variety of exercises geared to improving overall functional capacity. Exercise room education, proper posture & body mechanics, fall prevention & gait training will be included. Contact Tiffany today to receive 20% off your initial group session enrollment fee!